In ancient Egyptian society, the rich golden oil pressed from the Black (Cumin) Seed was named “Pharaoh’s Oil.” The people in this civilization used this oil externally to nourish the skin and hair. The Pharaoh’s personal physician is said to have carried around a bowl of Black Seeds to aid digestion. The Black Seed was so treasured that King Tutankhamun chose to be buried with a bottle of it. Even today in Egyptian & Arab society Black Seed herb & oil is highly prized for its numerous health and beauty benefits. 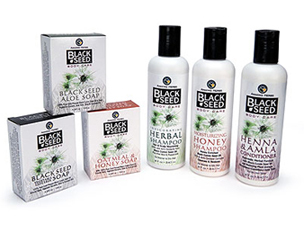 The Black (Cumin) Seed oil in our skin care products is 100% Pure and cold-pressed from organic Nigella Sativa seeds. It’s a rich source of EFA’s and Anti-Oxidants that help nourish and rejuvenate skin. SULFATE FREE Hair & Scalp Nourishing. Provides nourishing EFA’s and Anti-Oxidants from Black Cumin Seed oil. For Normal to Dry Hair. SULFATE FREE Cleanses & Restores. Helps restore hair's natural moisture and balance. For Normal to Oily Hair. Ayurvedic herbal formula. Helps strengthen, condition and add super shine. For All Hair Types.